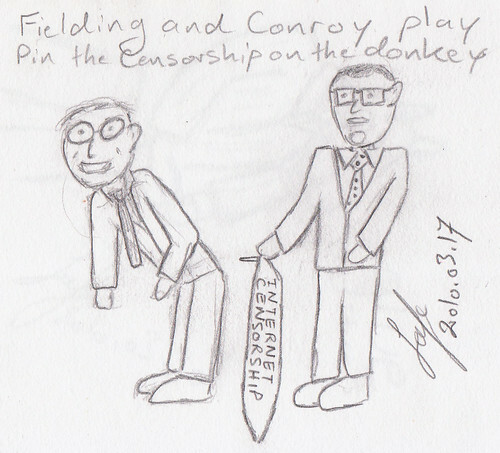 Stephen Fielding and Stephen Conroy play pin the censorship on the donkey. Drawn after I read the announcement that Fielding had won the minor party spot on the Cyber-safety Senate committee. Of course, this turned out to be wrong, and Ludlam won the position. But I think the cartoon is fitting. This entry was posted in Comics, Social, Tech and tagged cartoon, drawing, Stephen Conroy, Steve Fielding. Bookmark the permalink.